In total, there were 62 Letters including: 12 Typed Letters Signed by Fleming to Chopping; 9 Letters from Chopping, mostly copies, including one carbon and one fair copy to Fleming; and 41 letters to Chopping by others, including one of the directors of Fleming’s publisher Jonathan Cape Limited, Fleming’s secretary, and others involved in the production of the books and Chopping’s dust jacket designs. 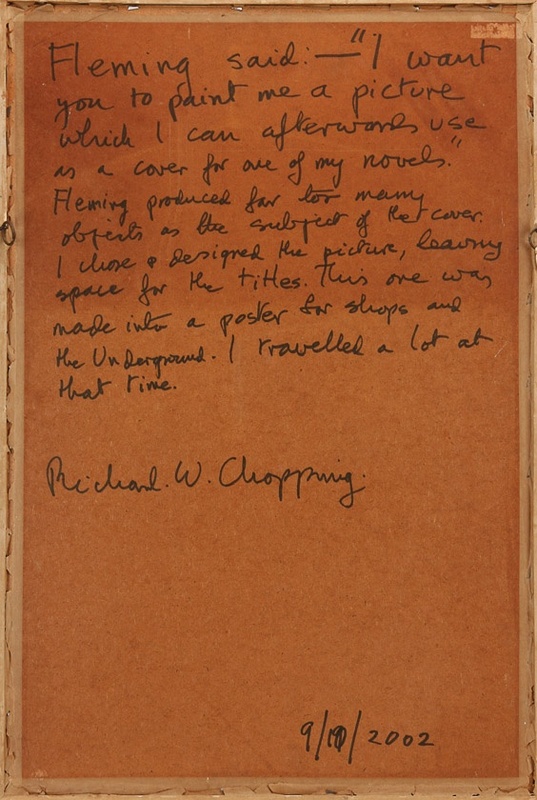 From the office of author Ian Fleming in 1961, below is a letter requesting the services of artist Richard Chopping. Chopping’s Trompe L’Oeil paintings – each of which took a month to produce – had already featured on four Bond novels, and having just finished writing The Spy Who Loved Me, Fleming was keen to secure his talents yet again. The letters from Fleming to Chopping discuss specific ideas for the jacket art, titles of the books, changes to be made, and other comments that illustrate the care and detail that went into their design. Other letters are from various Cape staff members, Fleming’s secretary Ira Trueblood, and a few from companies that would help Chopping with props, for example the Anglo American Corporation of South Africa, Limited, concerning the loan of a real diamond to use as a model for Diamonds Are Forever. 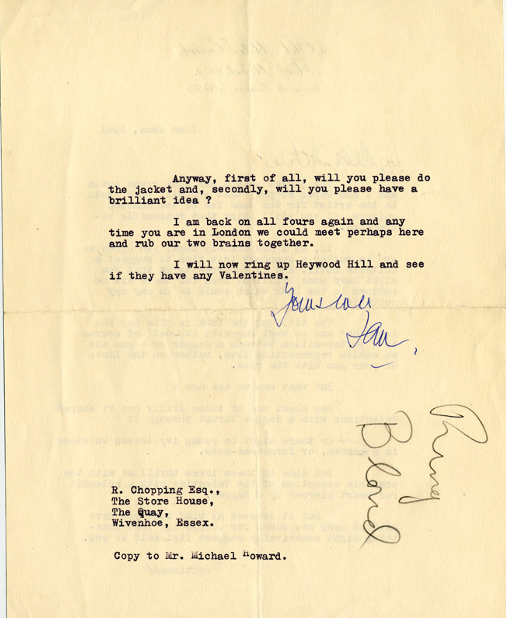 On April 8, 2010 Swann Galleries auctioned an archive of letters between Chopping, Ian Fleming, and others involved in the production of nine of the 007 covers between 1957 and 1966. The letters touch on details about the jacket art, praise for Chopping’s work, payment information, copyright issues, and other related topics. The lot sold for $57,600.